During GDC earlier this month Crytek had their Back To Dinosaur Island VR-demo on the show floor, which previously had been showcased in its earlier stages as a tech-demo during Gamescom last year. 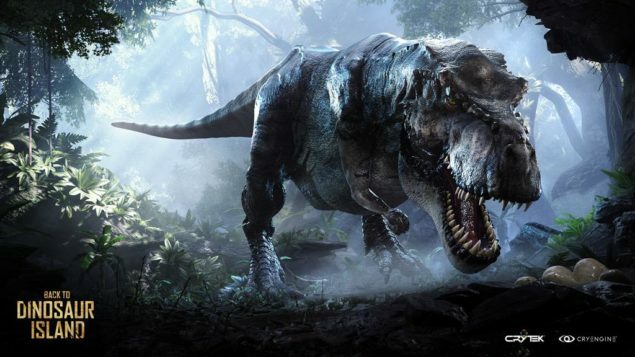 In an interview with VRFocus Cevat Yerli, CEO and President of Crytek, reminisced about what he suggests was a ‘pivotal’ moment in videogame graphics development. Namely the nVidia Geforce 3 chip, which Crytek developed a technical demonstration for, back in 2001 called X-isle – Dinosaur Island. In the Interview with VRFocus, Yerli said that Crytek thought it would be a great fit to take that old tech-demo from 2001, that “ignited the graphics industry in a way” and do the same thing with VR this time. In regards to Cryteks future plans for Back to Dinosaur Island, Yerli was for obvious reasons excited about its potential. Now that they are about to move on to the next stage of development, there are some obvious fears and worries, but Yerli is confident that more greatness is on the horizon. Yerli could not say too much specifically about Back to Dinosaur Island’s next stage of development, but he did mention that the demo they were showing during GDC was not a tech-demo, meaning that this might be their next new IP. So it would appear that the Back to Dinosaur Island VR-demo could in fact turn into a full-fledged title, and that could be pretty awesome.